My parents have a work colleague who only eats meat he hunts himself. Apparently the easiest way to answer “what does Canada Goose taste like?” is by gifting a whole Canada Goose. So when my parents visited recently, our challenge was to roast this newly acquired Canada Goose. 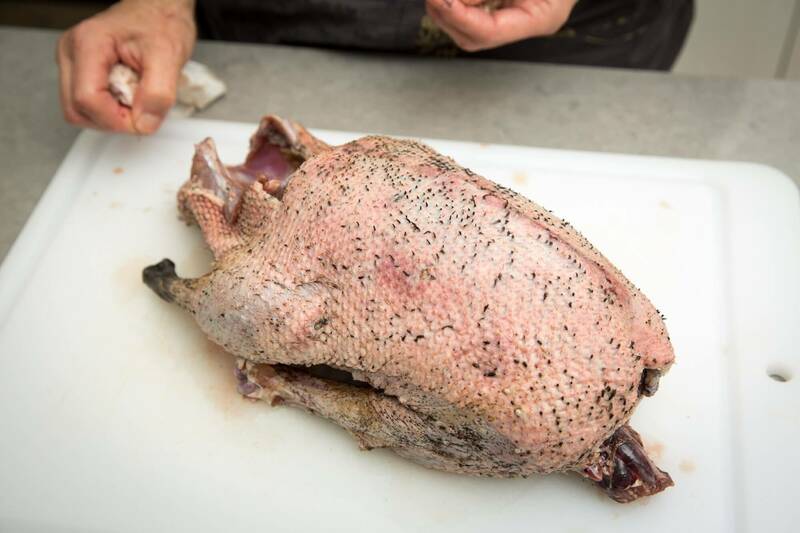 There are plenty of recipes and instructions for cooking domestic goose, but a wild Canada Goose is very different. There was no visible fat on this bird. She (or he?) was very lean. We figured we’d brine the bird overnight. If it helps with chicken and turkey, it must help here. We soaked the the Canada Goose in a typical brine that uses 1 cup kosher salt, 1 cup brown sugar, as many black peppercorns as I could scrounge up, and enough water to cover the bird. Then we started doing more research. We came across an article on Field & Stream that clearly outlined the risks we feared: Canada Goose need extra fat to keep them moist, and that “an overcooked goose is only suitable for your dog, and even he’ll grumble about it.” We didn’t plan on sharing this with the dog. So we used the Field & Stream instructions to guide us. After brining overnight, our first step in the cooking process was to sear the Canada Goose on all sides in duck fat. We dried off the bird, seasoned it (the entire surface and the cavity) with kosher salt and black pepper, and trussed the legs (or what remained of them… it appeared to have been shot in the one leg). My roasting pan is stove-top safe, so we melted about 1 1/2 cups of duck fast in the pan and seared the bird for a couple minutes on all sides until the skin was a nice golden colour. After infusing the skin with duck fat during the searing process, the next trick was to keep it moist during the roasting process. We cleaned out the roasting pan used for the searing (of course we saved the duck fat for other uses). We set the goose on a rack in the roasting pan, and added about 1/2-inch of chicken stock to the pan. This would steam during the roasting process and keep it nice and moist. 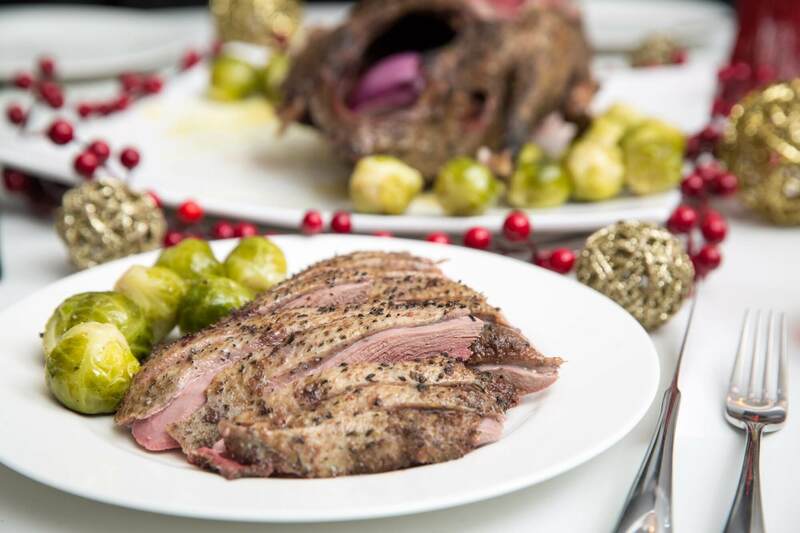 We roasted the goose at 325°F in a convection oven (for regular ovens, cook at 350°F). The Field & Stream instructions indicated it would take a couple hours to cook. They recommend testing with a meat thermometer every 30 minutes for the first 1 1/2 hour and every 10 minutes after that, looking for a temperature of 160°F in the thigh. We let the bird rest, and then carved as we would a turkey. The meat is intensely dark. Gamey but not offensive. If you like duck, you’ll enjoy Canada Goose. 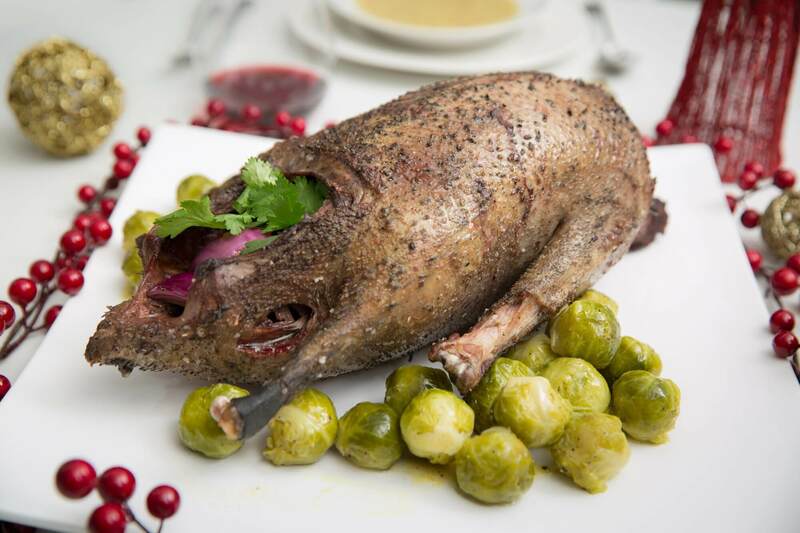 Carved roast Canada Goose with brussels sproutsP.S. I found a piece of bronze shot.